I have started loving the flavor of fennel seeds and the aroma they impart to any dish from the time I attempted Bhasbhatta (a variety rice from State of Kashmir). While reading through other recipes from this state, I came across yet another dish "Lauki Yakhni" which had these seeds in its recipe. 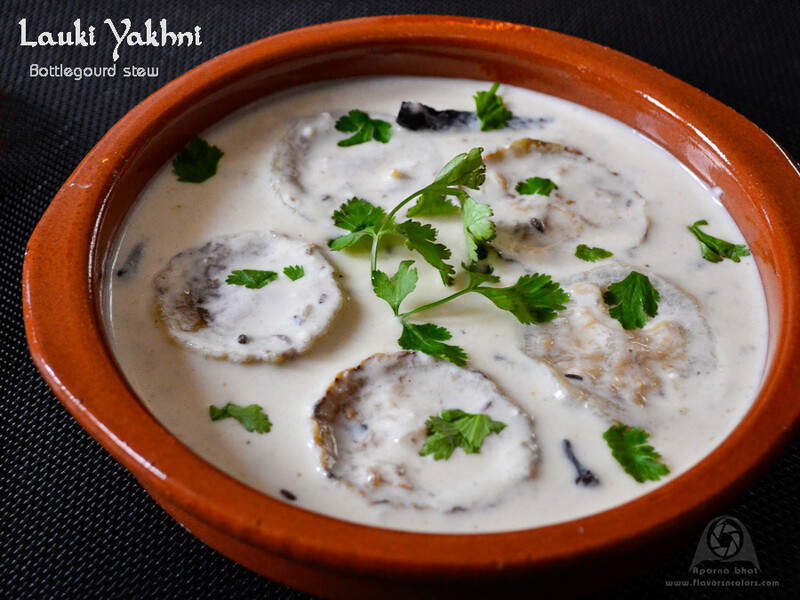 According to Kaushi Bhatia, the author of the book "Favourite dishes of India", incorporation of curd in this yakhni dish works wonder and the dish subtly spiced with fennel and dry ginger powder tastes so delicious that the taste lingers. While reading the description of the dish itself, my senses got stirred. I remembered the presence of lauki/bottle gourd in the fridge and rushed to kitchen to try it right away. 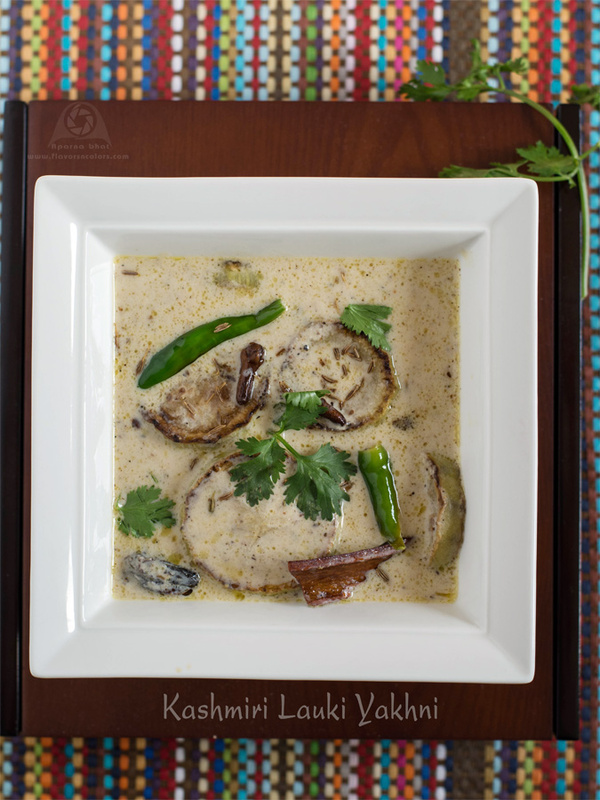 (Have adapted the recipe from the book as per the ingredients availability hence it may not be the authentic recipe for this dish). Wash and peel the bottle gourd. Slice into 1/3" thick round pieces. You can cut the bigger round pieces into 2 pieces each, through the centre. Heat ghee in pan and shallow fry them till they become lightly browned and soft. Drain them on tissue paper and keep aside. Heat 1 tbsp mustard oil in the same pan. Add cinnamon stick, cloves and cardamom. Saute them till they turn aromatic. Add slit green chili and fry it for 30 secs. Now add 1/2 cup water, fennel powder, dry ginger powder and asafoetida. Cook it for a minute. Next add fried bottle gourd slices. Whisk the yogurt and slowly add it to the pan. Cover the pan and cook on low flame for 2-3 minutes taking care that the yogurt does not curdle. Switch off the flame. Garnish it with mint leaves [used coriander leaves in absence of mint leaves]. 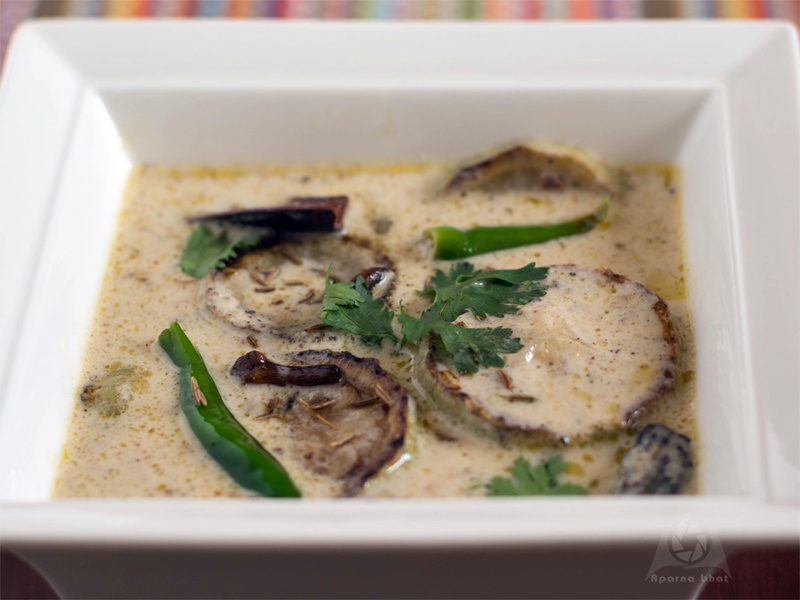 Serve this dish with steamed rice, rotis.